As part of a special online satellite series, Juicy Stakes and Intertops Poker sent five qualifiers in Tim O'Keefe, Chris Perkins, Elena Stover, John Curcurcu and Gabor Kresco to the Caribbean to compete in the main event at the Casino Royale inside the Sonesta Maho Beach Resort. Although none of these runners managed to make it past the second day of action, the online poker sites have continued to cover the TK Poker Tour action with reports on the opposition and how the qualifiers filled their free time. 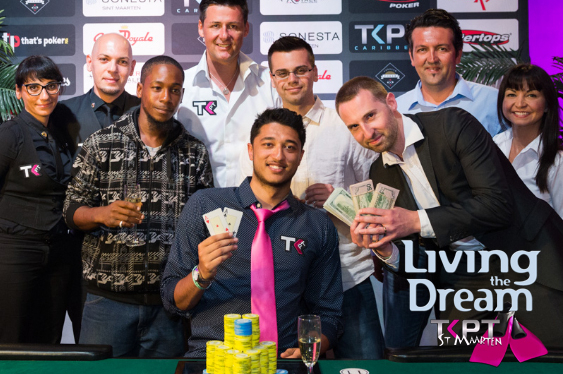 In the end, the TK Poker Tour main event title and its $17,000 cash prize was won by American Akash Mazumdar, who was returning to defend his St Maarten crown after only qualifying for last year’s extravaganza courtesy of a similar online satellite tournament series from Intertops Poker.